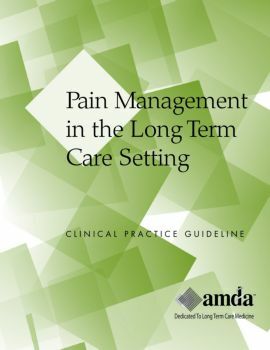 This package includes the Pain Management Clinical Practice Guideline, and the Pain Management Pocket Guide. Pain is common in the post-acute and long-term care setting (PALTC) setting. As many as 80% of LTC patients have at least one condition associated with pain. Although disorders that can cause pain to become more common with increasing age, pain itself is not a normal part of aging. The CPG outlines many of the myths and misperceptions about pain and discusses the barriers to effective pain management and offers steps for overcoming these barriers. The CPG is not intended to be a comprehensive treatise on all possible types of pain or on all evaluations, interventions, or medications for pain. Rather, it should serve as a foundation for a systematic approach to the recognition; assessment; treatment; and monitoring of pain in PALTC care patients. It is also hoped that, in some cases, it should be possible to anticipate and prevent pain from occurring. The pocket guide provides a quick reference to the general principles for prescribing and titrating opioids including opioid titration options. Pain medications, as well as non-pharmacological interventions, are also contained in this pocket guide. Sample Performance Measurement and Outcome indicators are included.